the trick is to go for hard edges otherwise this whole thinge would look too blobby. currently i have a stone making video tutorial in the making, but its not ready yet. perhaps the next week you can download it! the initial diffuse and normal size was 2048, but it also works both reduced to 512! Really looking forward to the video tutorial! 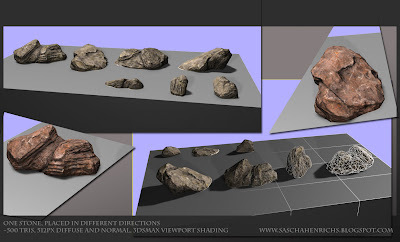 I need to make some good cave walls/stones, so I hope I can learn some techniques from the tutorial.